Flown by the United States Marine Corps and U.S. Air Force, it is mainly a heavy lift troop carrier, and has been deployed in both combat and rescue operations in Iraq, Afghanistan and Libya. 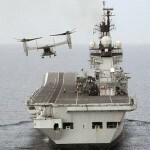 Six years ago HMS Illustrious became the first non-US ship to fly an Osprey and was pleased to welcome one back on board with it completing a total of four deck landings. Piloting the US Marine Corp aircraft as it landed at dusk was a Royal Navy Lieutenant – Alan Wootton – a former Army Air Corps pilot who transferred to the Royal Navy as a Lynx pilot. Al is on a three year exchange with the US Marine Corps and flew with co-pilot Captain Goudy of the United States Marine Corps. Lieutenant Commander Nigel Terry, deputy head of HMS Illustrious’ Flight Department was also on board when the Osprey visited in 2007. He said: “Opportunities like this present an invaluable opportunity to continue to grow our ability to work together with other nations. This is absolutely essential in modern naval operations. The visit gave the Osprey’s crew an opportunity to demonstrate the aircraft’s flexibility as well as being a good example of the strong relationship between Britain and the United States. While there are no current plans for the Royal Navy to operate the MV-22, close co-operation and training of this kind is vital to support operations in a coalition environment. Until recently, USS Kearsarge had three Royal Navy aircraft handlers embarked as part of the Long Lead Specialist Skills Programme. This programme seeks to retain and develop the specialist skills required to operate the Royal Navy’s new Queen Elizabeth Class Aircraft Carriers which are under construction at Rosyth dockyard. Three US Marines and six US Navy personnel also visited HMS Illustrious during the rendezvous. HMS Illustrious is currently part of the Response Force Task Group deployed on Cougar 13 operating in the Mediterranean, Red Sea, Persian Gulf, and Horn of Africa. It involves exercising with partner nations, and will show the UK Armed Forces’ capacity to project an effective maritime component anywhere in the world as part of the Royal Navy’s Response Force Task Group as commanded by Commodore Paddy McAlpine. The RFTG is the United Kingdom’s high readiness maritime force, comprising ships, submarines, aircraft and a landing force of Royal Marines, at short notice to act in response to any contingency tasking if required.